The conference is intended to give a retrospective and prospective view on comparative genomics. It will be the occasion to celebrate the 50 years of scientific contribution of David Sankoff, who is known as one of the founding fathers of molecular bioinformatics and computational biology. 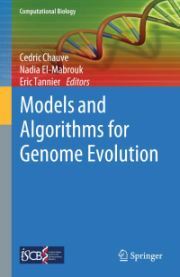 It will gather researchers from the mathematical, computer science and biological communities working in comparative genomics, phylogenetics and related fields. Among them, senior researchers, some of them recognized worldwide as being founders of this young research field, but also young researchers, as well as students and postdoctoral researchers. The goal is to create a synergy between researchers and students allowing for new collaborations to emerge, and to develop coherent tools that can be used to unravel the intricacies of complex biological datasets. We will share the latest developments, discuss about future directions and goals that will be driven by the huge influx of sequence and related data. The conference will be held at Hôtel Château-Bromont, in Quebec's Eastern Townships region, near Montreal, August 23-26, 2013.